Oh to be like Rihanna and be able to look this hot in a crop top and a pair of shorts! Here she is performing at the Hackney Weekender this weekend and I've managed to find a couple of pieces to help you rock out her look at just a fraction of the price! What do you think? This is the second in the 'Steal Their Style' Series, check out the summery Frankie Sanford look here. 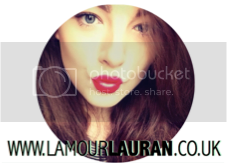 If you have any request, comment below or Tweet me @LamourLauran. I know! What a bargain! Thanks for reading and I'll be sure to keep them coming. If you have any requests , let me know via Twitter.